François Xavier Tourte was born in Paris in 1748. The Tourtes were a well known French bow making family. François's father (Nicolas Pierre Tourte) taught him and his brother (Nicolas Léonard Tourte) to be bow makers. François Xavier also apprenticed to a clock maker as a young boy. Learning these crafts early, F. X. Tourte became extremely skilled and later would be known as the creator of the true model of modern violin bows. Tourte pére (Nicolas Pierre Tourte) died in 1764, leaving François and his older brother in charge of the business. F. X. Tourte had made "Cramer" model bows (a transitional model between Baroque and modern bows), which had been in strong demand since 1775. F. X. Tourte had used many kinds of exotic woods, but around 1775-80 had settled on using pernambuco. More expensive than other woods, it possessed every quality he was looking for in a bow: rigidity, responsiveness, elasticity and a beautiful sound. Luckily for Tourte, he was able to select from incredibly large quantities of pernambuco for his bows. There was a high pile of pernambuco logs that covered 168 acres in Paris during that time. One estimate is that, to find a great piece of pernambuco for a bow, Tourte (and later other Parisian bow makers) would sort through eight to ten tons of Pernambuco. In 1782, violin virtuoso Giovanni Battista Viotti arrived in Paris in hopes of finding a bow maker that could improve the bow in terms of material as well as form. Viotti, who had asked several bow makers for help, heard of the Tourte brothers' reputation and found François's work to be exactly what he had been searching for. - He lightened the weight of the head of the bow while still keeping its strength. - He changed the arc of the bow from convex (away from the hair) to concave (towards the hair). This brought the center of gravity closer to the frog of the bow, making it stronger and more responsive. - He established an optimal distance between the stick and the bow hair. - He invented the ferrule and the spread wedge, which made the hair come out of the frog in a flat ribbon instead of bundled. -He cut straight sticks for the bows, and only curved them after shaping them (previously, sticks were cut with their curved shaped). This allowed the grain to run uniformly along the length of the stick, improving the bow's stiffness and strength. With these changes, F. X. Tourte created bows that would eventually become the model for the modern bow. Many of the things we take for granted today, the curve of the bow, the balance of the stick, etc., took Tourte years to perfect. The slightest change to a bow could leave it with unbalanced weight; too heavy, too light, too weak or too strong. His early work as a clock maker served him well also. Because of that, he was able to do extremely precise work developing the hair tensioning mechanisms as well as adding beautiful details with tortoiseshell, ivory, silver, and gold. From a luthier's point of view, the interaction between Tourte, the bow maker, and Viotti, the violinist, is really quite beautiful. Neither artiste could accomplish his goals without expertise from the other. Even in the 21st century, the best of violin and bow makers relish and respond to their interactions with players. Neither craftspeople or players can exist and progress without the other. 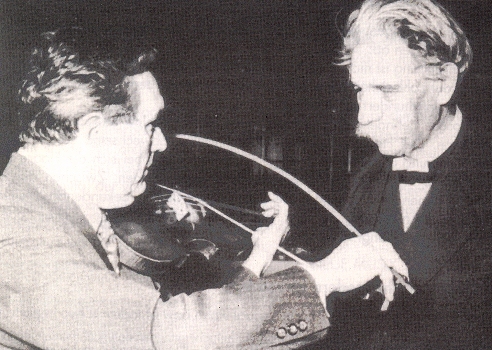 F. X. Tourte continued to make bows until his mid 70s. He died in 1835, at 87 years old. 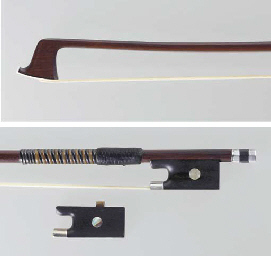 François Tourte's bows still stand as a guide for present and future bows. His painstaking work in the modifications of what we now call "Baroque violin bows," gave us a reason to modernize our instruments, and gave us the opportunity to play them with many different techniques that could not be accomplished before his time. Take a look at our Carbon, Hybrid, and Pernambuco Bows! The information on Baroque bows here and the picture of the Vega Bach bow (invented in the early C20th based on a fiction) are inappropriate. I would recommend removing information suggesting baroque bows are highly arched - they arent. Yes, really good article except for the pictures of the Vega bow. Baroque bows were (are) nothing like that. The arch might get to 1 1/4 or 1 1/2 inches from the hair in the center of the bow. Not nearly as extreme as pictured. The Vega bow was a really interesting experiment in the 1950s, but it's clear that is not how baroque bows worked. 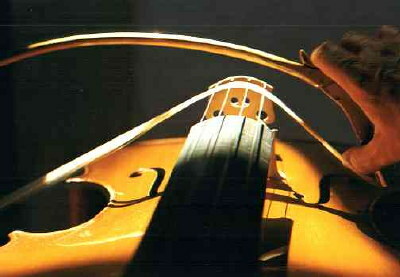 A convex-arch bow does make it possible to play chords with less force than a modern bow requires, but only incrementally so. Bows in Bach's time were not really designed to put hair on 3-4 strings at once. If anything it is likely that Bach was familiar with a short, light Italian-style bow which wasn't optimized for chords but excelled at fast string crossings and intricate maneuvers that Bach requires. Ironically, the best analogue to a Bach bow today might be the very light (50-55) carbon fiber sticks made by Arcus. They are whippy and extremely quick. Very high tech but arguably more authentic for playing baroque and early classical music than a Peccatte or Sartory type bow.